DC Moore Gallery is pleased to present Inflection Point, an exhibition of two ongoing bodies of work by Eric Aho, spanning the years 2000 to 2016. 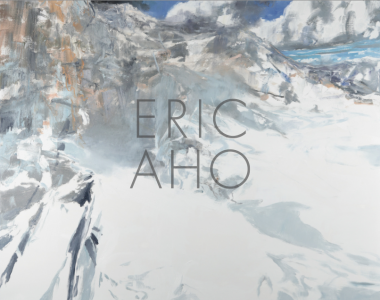 On view together for the first time, Aho’s Ice Cut and Mountains series explore the tensions between history, memory, and concepts of beauty through the artist’s luminous depictions of winter. Aho’s fascination with the season and the ephemeral qualities of its two primary elements—snow and ice—has been a central preoccupation of the artist for more than twenty years. Together the series investigate the contrasting extremes between interior and exterior worlds, both psychological and physical—their simultaneous moments of rupture and confluence. The Ice Cut series takes avantos as their subject matter. An avanto is a traditional Finnish hole cut into the surface of a frozen lake, through which one is meant to plunge after the intense heat of a sauna. The artist himself has been cutting avantos and then painting their dark recesses and uneven, iridescent contours each winter for the past decade. In 2016 Eric Aho’s work was on view at the New Britain Museum of American Art, CT, in Eric Aho: An Unfinished Point in a Vast Surrounding and in Eric Aho: Ice Cuts at the Hood Museum of Art, Hanover, NH. Recent shows of his painting include Eric Aho: In the Landscape at the Federal Reserve Board, Washington, DC (2013) and Transcending Nature: Paintings by Eric Aho at the Currier Museum of Art, Manchester, NH (2012). His work is included in the permanent collections of The Metropolitan Museum of Art, New York; Fine Arts Museums of San Francisco, CA; Museum of Fine Arts, Boston, MA; National Academy Museum, New York; Hood Museum of Art, Hanover, NH; New Britain Museum of American Art, CT; and the Currier Museum of Art, Manchester, NH, among many others. Aho’s work has been shown internationally in Ireland, South Africa, Cuba, Norway, and Finland. He was elected Academician of the National Academy in 2009. Aho lives and works in Saxtons River, Vermont. A fully illustrated catalogue with an essay by the artist will accompany the show. View a short video of Aho cutting an avanto here.